This interview is part of an ongoing series of conversations with the Areaware designers. We asked our Fall 2017 designers to select someone to conduct an interview with them about their practice. Brandon Wilner, designer of our new Mirror Bookmark spoke with Daniel Levin Becker, a critic, editor, and translator who lives in Oakland, CA. Together they discuss concrete poetry, palindromic philosophies and make a case in defense of nonsense. Daniel Levin Becker: Is there anything that you consider direct precedent for the Mirror Bookmark project? Are you familiar with Anthony Etherin, whose work includes a poem called “Many Worlds” that is printed in a four-way mirror kind of configuration? Or Derek Beaulieu? Brandon Wilner: Well there’s obviously a great deal of experimental palindromic work that precedes this object, but one book that I had in mind while I was coming up with it is Hannah Black's 2016 book Dark Pool Party. This seems to me, at least formally, like a recent precedent. It has all of the forward-reading text on the book’s recto, with it reflected in gray ink on the verso. I've never really heard her discuss this quality of that book, though. DLB: I hadn’t seen that Hannah Black book, but it’s an enchanting effect, all the more so if, as you say, no attention is drawn to it. Sight almost totally unseen, it makes me think half of overprinted pages (where the metal type has come down so hard it embosses the letter backwards on the other side) and half of a book bound before the ink dried—both of which together conjure the pleasing image of the page as a surface where text normally lies flat but sometimes, through accident or ambition, transcends that plane and rises above or sinks below. That’s a terrible explanation of what I’m visualizing, actually. The back cover of Hannah Black's Dark Pool Party (Dominica Publishing/Arcadia Missa, 2016). BW: I do know Anthony Etherin's work, but just through his Twitter, which is very palindrome- and anagram-heavy. I know Derek Beaulieu as a visual poet. I just looked up Etherin’s "Many Worlds” and can see that it was published by Ken Hunt's Spacecraft press which also published my very small chapbook Complete Works. "Many Worlds” seems related to the Mirror Bookmark project, though it's still much more laborious than anything I'd expect my palindrome machine to produce. 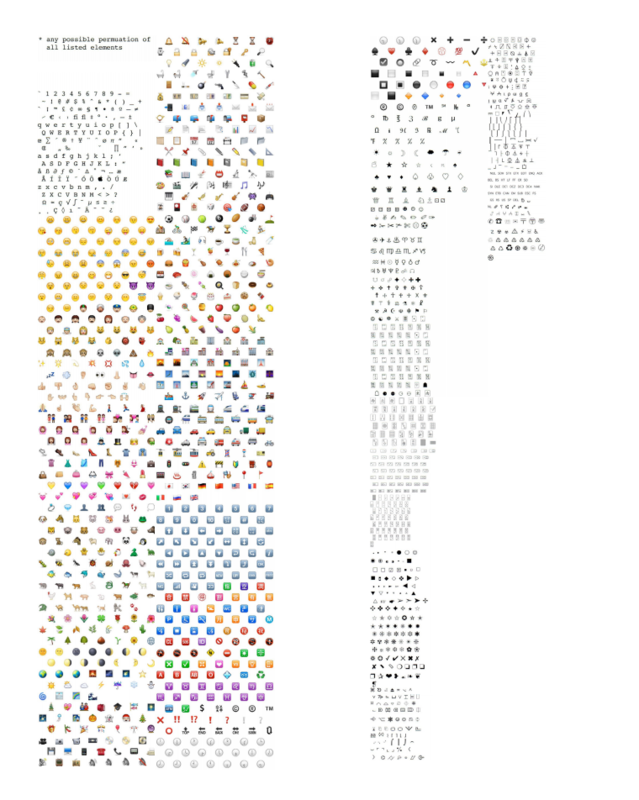 This is like a well-organized spreadsheet, and the Mirror Bookmark's output is just piles of words. I’ve been saying that it extends palindromic possibility to the nonsensical: whereas a traditional palindrome has the same meaning when read in either direction, the palindromes created by the bookmark have the same lack of meaning either way. An excerpt from The Complete Works of Brandon Wilner (Spacecraft Press, 2015). DLB: Why multiply lack of meaning, even in a precise way? Can two nonsenses make a sense? I suspect you’re being a little deflective here, because Mirror Bookmark could certainly stop before pushing its palindromes into the nonsensical: it introduces the possibility of angled palindromes, for instance—as seen in some of the examples we’ve been exchanging, all of which are however restricted to perpendicularity—not to mention palindromes in a visual sense, which I guess brings us squarely into the territory of plain old mirrors. BW: Yes, I have identified some other strengths that it has, one of which is the ability to open up letters' similarities for play. If you put it next to the word "did," you get "did bib." With some effort, one could produce a sentence whose letters react favorably to reflection, so that when the mirror is introduced, the meaning completely changes. I have obviously not yet exerted this effort. It's worth noting, though, that this sort of writing would be designed specifically for use with this tool, which is different from writing that is produced with it. I feel as though I should defend nonsense here. I don't think that it's self-deprecating to say that the bookmark produces a lot of nonsense, as literature, and particularly poetry, is full of expressive nonsense. M. NourbeSe Philip's Zong!, which has pages and pages of unrecognizable words, is also deeply affecting because the nonsense spirals outward from the words of the Gregson vs Gilbert court document, the only official record of the massacre of 133 African slaves aboard the Zong ship. She says that the book tells "the story that can't be told but must be told," and the unfamiliar letter combinations play an important role in this telling. Norman Pritchard likewise uses non-words that bear just enough of resemblance to words to stir something up in the reader. 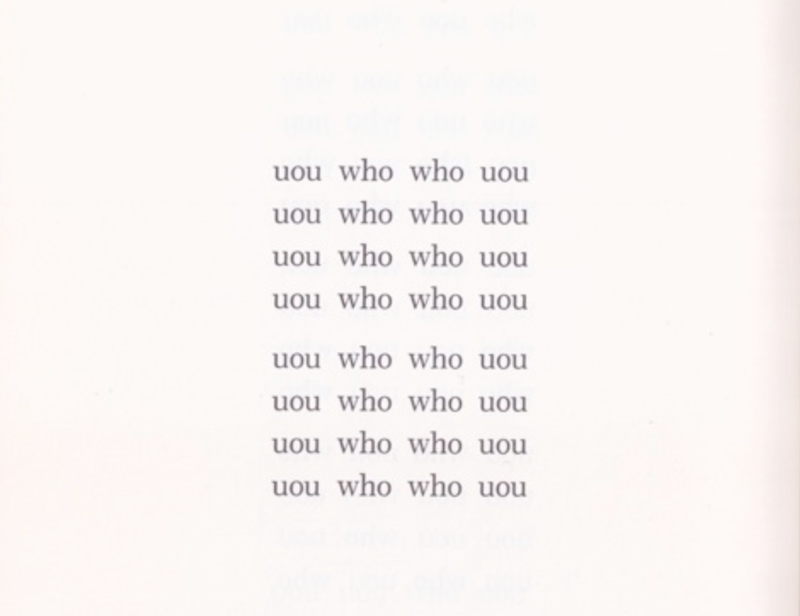 From N.H. Pritchard's The Matrix: Poems 1960–1970 (Doubleday & Company, 1970). Nonsense is perfectly viable, it's just the sheer amount of it that Mirror Bookmark produces that's difficult to square, which, yes, is where the author's judgment would come into play. (I think) I remember that you ended your book on Oulipo, Many Subtle Channels, with the thought that the work involved in constrained writing is what separates a word game from something of literary merit. What do you think about how little "work" goes into the bookmark's palindromes? Mirror Bookmark seems Oulipian to me in that it’s a tool for recognizing potential—which may or may not be the same thing as manufacturing potential—or perhaps just searching for it. Literary merit as such is up to the practitioner/finder, not the tool, just as having a magnifying glass in your hand doesn’t tell you anything about what’s worth looking at more closely. Or maybe it does, in the when-you-have-a-hammer-everything-is-a-nail sense of things, but that’s a conceptual difference, not a technological one. I don’t know if that makes any sense (aha!). What was the initial inspiration for the object? Was there a moment where something clicked and you knew you wanted to or were going to make it, how to do it, etc.? Testing polished stainless steel on Sianne Ngai's Ugly Feelings (Harvard University Press, 2005). BW: I was trying to think of this recently, actually, and couldn't recall what made me think this was a good idea. It was probably a combination of having a few friends who are designers and who have contributed products to Areaware, and the simple fact that mirrors cross my mind relatively regularly. It just occurred to me that I might have an outlet at hand for making something that distilled a silly fixation into an evocative thing. BW: The form arose as a logical extension of the essence of a palindrome: that it is composed of “reflected” text. All I had to do was remove the quotation marks from that word. I do remember that I tested the idea out on people by veiling it as a joke. After I'd talked about it with a few friends, I saw my friend (and Areaware's Chief Design Officer) Lisa Cheng Smith at an art opening and pitched it as a little bit more than a joke. DLB: What are some of the best (define that how you will) palindromes you’ve made so far with the bookmark? BW: In the gestation period for it, when I spent a few weeks trying to figure out how to create a prototype (it cannot be overstated here how few actual design skills I have), I was having a couple slices at a pizza spot in Soho. There was an ATM in the restaurant, and one of the walls that ran perpendicular to it was a mirror. So I was just staring blankly as I ate, and I noticed that with the reflection, the machine read "MTA ATM," which seemed to me a perfect New York palindrome, even better because all the letters used were symmetrical. This one didn't use the device, per se, but at this point I consider it the towering achievement. ATM reflected in mirror at Famous Ben's Pizza, New York City. DLB: Palindromes in the wild are so great. My mom collects them, and looking over this online repository she keeps I notice how none of them are actually symmetrical: there’s 58885, but not 58882. (There are any number of reasons for this, the most likely being that she’s not a completely irresponsible driver.) What if she made a rap album and called it MC MOM? 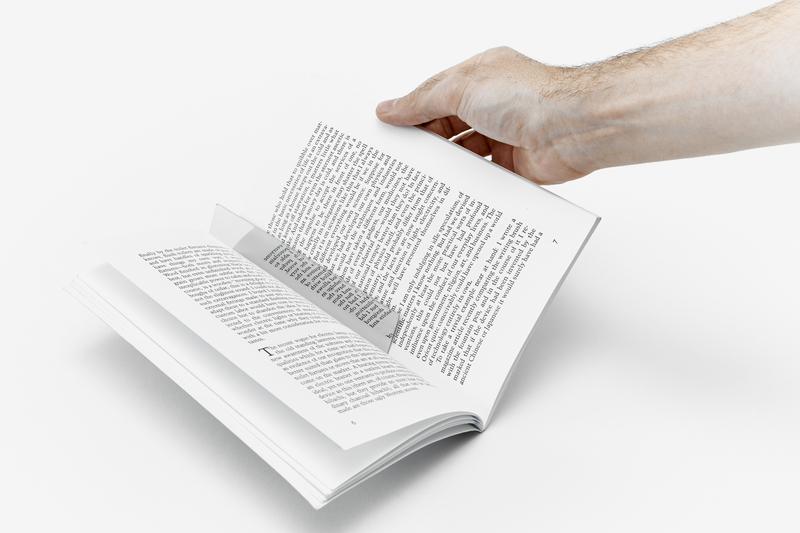 Bryce Wilner testing a prototype of Mirror Bookmark on The Life and Opinions of Tristram Shandy, Gentleman (Penguin Classics, 2003). BW: I also gave one of the prototypes to Bryce, and he sent me a photo of him using it on these lines of Tristram Shandy that have asterisks all the way across the page. That was great because it made me realize that its use could play with punctuation in ways that traditional palindromes do not. In "A man, a plan, a canal—Panama," for instance, the punctuation just has to disappear when you consider it backwards. Not so with a line full of asterisks, or a line of backwards prose that doesn't really make sense anyway. —either of which would be fun to hear read aloud. Do you think it’s possible to create a version of this device that produces false palindromes? BW: Interesting…. I guess “false” here may mean something akin to a palindrome that resembles Oulipo’s “Canada Dry” constraint, that would look almost exactly like a palindrome while having some little interference that makes the characterization incorrect? I can't tell if I'm just thinking about this too lazily. 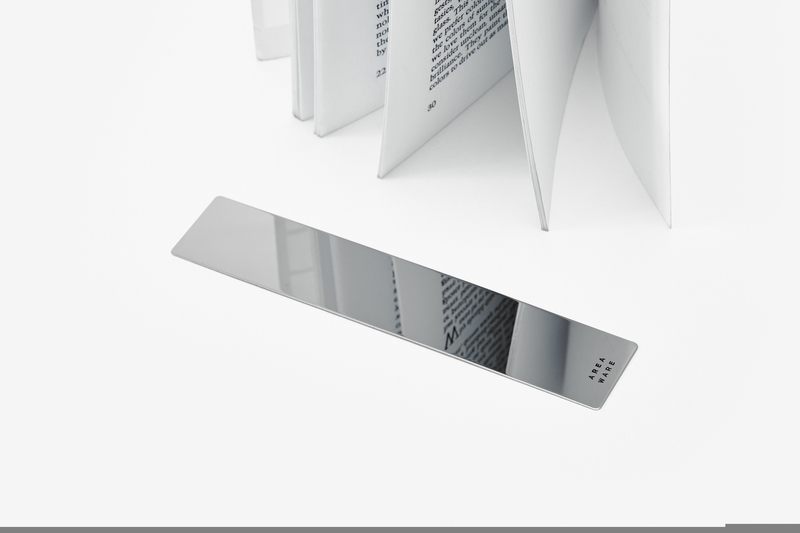 I can say that another thing that was so attractive about the Mirror Bookmark is how completely simple it is. While you're using it, the magic happens right there in your hand, and it's immediate. A false palindrome machine as I'm imagining it would have to be much cleverer, and so probably much more complicated. I also think that I'll have critics who claim that the vast majority of palindromes created by this machine are already false. I’m fine with this criticism—I understand that palindromes are a source of wonder for many, and that heaps of reflected gobbledegook might not be seen as deserving of that kind of attention. I too enjoy rigor and attention to detail in written experiments, but it can also be great to loosen them up a bit so meaninglessness can have some of its due. Brandon Wilner is a reader, writer, and twin who lives in New York. He co-runs the reissue label Fake Music Re-Anticipations and has a bi-monthly radio show on the Lot Radio. His work can be found via Publication Studio; the Summer Forum residency journal, Dilettante; and the music website Resident Advisor. He holds a Master’s Degree from Columbia University’s Department of English and Comparative Literature. As for designing, if he thought that conceiving of objects were more dangerous than living in general, then he probably wouldn’t do it. Daniel Levin Becker is a critic, editor, translator, and Oulipian. He lives in Oakland.